Proponents, such as Nobel Prize winner Paul Crutzen, argue we’ve left the Holocene, which began 11,700 years ago, and started a new geological epoch. There is no scientific consensus in the field of geology and the anthropocene is not yet formally recognized as an epoch, but their is little doubt humans are changing the world in which we live. The global environment has significantly altered during the past few centuries, from climate change and mass deforestation to artificial fertilizers, global supply networks and rapid urbanization. These transformations are not universally negative or apocalyptic, but even the more benign result in a new dynamic between humans and the other lifeforms with which we share the planet. For this reason, the anthropocene is developing into a major field of study and is starting to gain some traction in the media (see this radio documentary produced for The Current on CBC Radio and a cover story from The Economist, both from 2011). 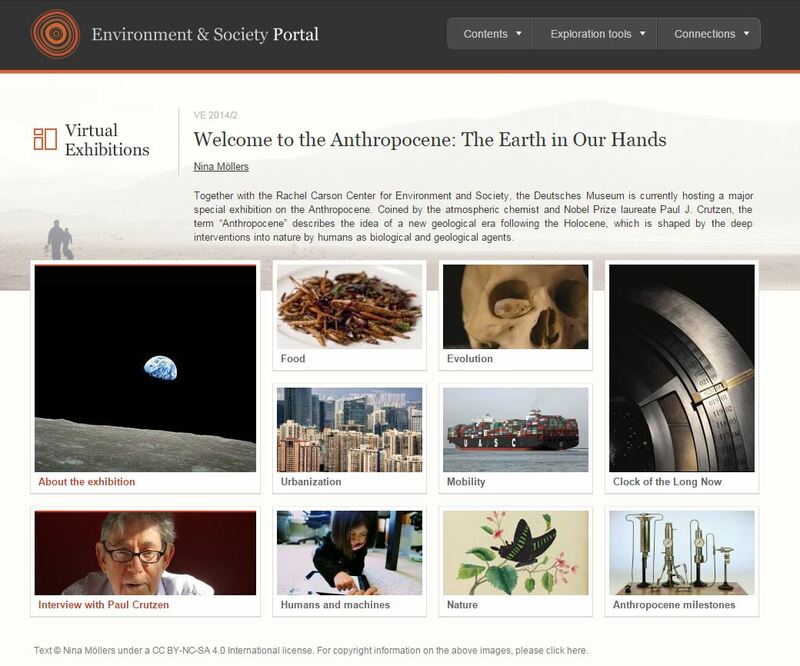 These media stories along with the success of the first month the Deutsches exhibition suggests the anthropocene is transitioning from an academic to a public discussion. My single biggest takeaway from the exhibition is the value of an interdisciplinary perspective on global environmental change. The Deutsches Museum presents research from the life and physical sciences alongside historical analysis and a wide array of perspective from the social sciences. The anthropocene thesis developed out of the natural sciences and a range of scientific disciplines provide crucial perspectives on how humans are changing the environment. Biologists track species on the edge of extinction, toxicologists identify the heavy metals and synthetic chemicals that permeate the environment and our bodies, and climatologists, physics and oceanographers collaborate in an effort to model and predict the future of our climate. Scientists also work with increasingly deep time series data to better understand past environmental change. They provide technically sophisticated methods to gather this data, from ice core samples, to tree ring analysis and pollen fossil records. To fully understand the anthropocene, however, we need to also investigate human culture, economies, societies and politics. Historians can help us understand how and to what extent the development of an industrial economy in eighteenth century Britain led to environmental changes all over the world. 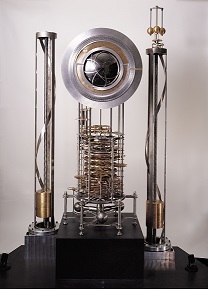 Simply marking the start of the anthropocene in 1712 with Thomas Newcome’s invention of an atmospheric engine provides little insight into the complicated history of hydrocarbon fueled global economic development. Historians provide a nuanced perspective on how the local use of coal powered steam engines to pump water from coal mines led to the global exploitation of coal, oil and gas to fuel industrial development. Geographers and economists can help us better understand the complex networks of global trade and industry that continue to extract resources and produce goods and services at once unimaginable scales. The anthropocene requires an active conversation between literature scholars, anthropologists, philosophers, political scientist, psychologists with researchers from the natural sciences. No one field will solve the many challenges presented by the anthropocene alone. Finally, we need film makers, journalists and museum curators, along with public events to help build connections between this interdisciplinary academic research and people from around the world. The Willkommen im Anthropozän does this very successfully, not only through the exhibition, but also with a number of public talks planned over the next year and through the publication of the a comic book: 30 Anthropocene Milestones: Illustrating the Path to the Age of Humans. The exhibit begins with a large number of screens presenting maps and videos showing the influence of humans on the planet and global equality. 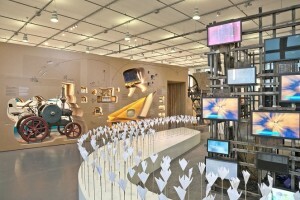 Behind these screens there is a wall, made of cardboard, with different technological milestones embedded, from an early tractor through to more recent computers, satellites and cell phones. These anthropocene milestones provide an effective introduction to the growing speed of technological innovation and the multiplicity of technologies changing humanity’s role in the world. Behind this wall, the exhibit is organized in six islands that use artifacts, art (including a large Crochet Coral Reef) and interactive displays to explore six themes. These islands present current developments and major environmental challenges alongside a historical perspective. The Mobility Island, for example, discussed the scale of global transport using modern container ships, alongside a Wardian case, used to transport live plants such as coffee and tea by ship starting in 1829. We end, I think, at what might be called the standard paradox of the twentieth century: our tools are better than we are, and grow better faster than we do. They suffice to crack the atom, to command the tides, but they do not suffice for the oldest task in human history, to live on a piece of land without spoiling it. Will this remain the standard and now significantly more global paradox in the twenty-first and twenty-second centuries? Ten thousand years from now, will the Clock for the Long Now be a ruin of a collapsed global civilization or an artifact of a pessimistic moment before humanity came to terms with the anthropocene and charted a sustainable path forward? If you have the opportunity to visit Munich this year, recommend visiting the museum, but if not, the Rachel Carson Center produced an English language digital companion on their Environment and Society Portal. Jim Clifford is a Carson Fellow at the Rachel Carson Center for Environment and Society and Assistant Professor in the Department of History at the University of Saskatchewan. He is an editor of ActiveHistory.ca.